After a much-welcomed break of a few days, war was on again for the Waddington squadrons tonight. It was a bright, sunny day as the ground staff began to prepare the aircraft with 1,950 gallons of fuel and more than ten tons of bombs each, and the crews began their own preparations. Phil Smith was among a number of crews who took their aircraft on air tests during the day. Also on the air test with him was Pilot Officer Anthony Tottenham, a new pilot who would also accompany the crew of B for Baker on the operation tonight. The target was Stuttgart and it was to be a big effort from both squadrons: 463 detailed seventeen crews and 467 had nineteen on the battle order, with at least one of them (skippered by Flight Sergeant Roland Cowan) taking a 463 Squadron aircraft as their own was not available. For Pilot Officers Roland Llewelyn and John Roberts it was to be a significant day. They were on their first solo operations as captains. The first aircraft to depart Waddington, with Roberts at the controls, departed at 19.04 hours. They faced a flight of some 1500 miles, or almost eight hours in the air. In all, a force of 863 bombers were sent to the city. Ten Mosquitos were sent on a diversionary raid to Munich in support of the Main Force, to drop spoof route markers and target indicators in a bid to look like the opening of a large attack. Meanwhile more Mosquitos were to attack Stuttgart ten minutes before the Main Force arrived, then twice more after it left. Other planned targets were to be the Amiens marshalling yards by 140 Halifaxes and Stirlings, an aero-engine factory at Woippy (near Metz) by 22 Lancasters and airfields in Holland by Mosquitos. Finally, other aircraft would be engaged on Serrate anti-nightfighter patrols, mining sorties, Resistance operations and some leaflet trips by Operational Training Unit crews. The two Australian squadrons flew their aircraft via Reading to cross the coast near Selsey Bill, just east of Portsmouth. Not for the first time, the crew of Flight Lieutenant Jack Colpus encountered mechanical trouble in JA901. On this trip most of the crew felt ill from a defect in the oxygen system, and there was also a problem with the hydraulics that powered both turrets. The mid-upper gunner needed to refill the ‘spindle’ that supplied the system with oil “at least 40 times before getting to [the] target.” At least on this occasion they reached their objective and returned safely: since late January, mechanical breakdowns had forced this crew to make two early returns from operations. The first aircraft to fall to enemy action was shot down by a nightfighter over the Channel. The bombers crossed the French coast near Le Havre, where flak claimed another aircraft. South-west of Paris, the bombers turned towards the east for a long leg of some 350 miles. A number of crews complained that the length of this segment of the route made navigation difficult. “Suggest on such a long leg as tonight a route marker off track would have given a good check,” said Flying Officer Alan Finch in his post-raid interrogation report. Perhaps this contributed to the loss of four aircraft which were shot down by flak on this leg. An hour before reaching the target, Pilot Officer Colin James of 463 Squadron had a starboard engine catch fire and lose oil pressure. He feathered the engine but was struggling to maintain height on three. They jettisoned their two thousand-pounders, discovered they could now just about stay in straight and level flight, and so limped on to Stuttgart. Seeing the large force of bombers approaching on their radar screens, the German nightfighter controllers had to judge where the likely target would be and subsequently where they should deploy their aircraft. Tonight they split their forces into two: one group was positioned near Metz, north of the bombers’ outward track – perhaps drawn there by the Woippy force – and the second was even further to the north. The first group caught up with the main stream near Epinal. From here they fought a running battle all the way to the target, making a reported 24 attacks and in the process claiming ten bombers. Not far from Lake Constance on the Swiss-German border (which would become infamous as the site of one of the world’s worst mid-air collisions in 2002), the diversionary Mosquitos continued another 120 miles east towards Munich. The Main Force, however, turned north towards the real target – Stuttgart. But the controllers were not deceived by the spoof flares and bombs at Munich. They moved their second group of fighters into the target area, waiting for the bombers. During an operation, experienced crews would act as ‘wind finders’ for the entire force (Jack Colpus’s crew were tasked with this role on this trip). The navigators of these crews would calculate the wind they were experiencing at regular intervals, and then transmit it back to Bomber Command headquarters, where it would be compared against the results of all other windfinders, and an average re-broadcast to the rest of the Main Force. Tonight, it was discovered that the wind was stronger than forecast and the stream was running late. The first Pathfinder markers dropped at 23.09, one minute before the planned zero hour but four minutes later than scheduled. Subsequent Pathfinders and Main Force crews were up to fifteen minutes late, and the attack became a little drawn-out. Some crews even dropped their bombs on a flare believed to have been a German decoy (possibly the one seen by Pilot Officer Victor Trimble, about 20 miles short of the target). Reading the crews’ post-raid reports in the Operational Record Books, the salient feeling is one of disappointment. The Pathfinders were late, and though there appear to have been short periods when the target indicators were reasonably concentrated there were other times where only a single Wanganui skymarker flare was visible. One crew were even forced to bomb the “estimated centre” of the position where they had just seen three Wanganuis fizzle out (this was the crew of Pilot Officer Fred Cassell, who had lost an engine earlier in the trip and were the last Waddington aircraft to bomb as a result). Many crews reported seeing incendiaries burning on the ground well short of the aiming point. The stream itself appears to have been reasonably concentrated however: at 23.24 hours no less than nine Waddington aircraft bombed in the same minute. One of them, captained by Flying Officer Jim Marshall, passed so close behind another aircraft it was thrown around by wake turbulence violently enough to upset the gyro compass. Surprisingly, the target was only relatively lightly defended. The flak guns put up a loose barrage as the bombers arrived, and there was virtually no searchlight activity. Even so, the ground defences claimed three attackers. Many crews reported seeing fighters over the target and twenty three attacks were reported, but only two more bombers were shot down at this point. After bombing, the stream flew on another twenty or so miles beyond the target before starting a big turn towards the south west (Jim Marshall’s aircraft got a little lost here and ended up passing between Karlsruhe and Mannheim, a little to the north west of the intended track, a result of the compass upset they suffered over the target). Two bombers fell to nightfighters before the French frontier was reached south of Strasbourg, and flak claimed one more there as the bomber stream turned west towards the coast. A further two aircraft were shot down by radar-controlled nightfighters over France. A few crews complained that, once again, some bombers had jettisoned incendiaries on the way home. Pilot Officer Harold Coulson opined afterwards that Something Should Be Done to stop the practice as the route home was marked clearly by them, increasing the risk of fighter interception. The crew of one bomber bailed out near Beauvais on the final run to the French coast, though it was not certain whether or not this was due to enemy action. The bombers finally crossed the enemy coast again near Dieppe, returning to their bases the same way they came out via Selsey Bill and Reading. Approaching Waddington just before four o’clock in the morning, the crew of 463 Squadron Lancaster ED606 – captained by Pilot Officer William Graham – could perhaps have been forgiven for relaxing just a tiny bit. After all, they had just completed their very first operation as a crew. They had flown deep into enemy territory, taken part in a massed bombing attack and were now back safely over a friendly country. But disaster struck while they were circling overhead the airfield awaiting their turn to land. A 625 Squadron Halifax, returning to its base at Kelstern (22 miles north east of Waddington), flew straight through the Waddington ‘stack’ and collided with the Lancaster. They crashed at Branston, just a couple of miles from Waddington. All on board both aircraft were killed. All 467 Squadron aircraft returned safely, but as well as the men involved in the collision so close to home, 463 Squadron lost one more crew on this trip. ME573, captained by John Roberts, had been the first aircraft to depart Waddington earlier in the evening. Their Lancaster crashed just north of Stuttgart with the loss of all on board. Roberts led one of a total of thirty six crews which failed to return from Stuttgart. Nine of these were known to have fallen to flak and seventeen to nightfighters. Two were believed destroyed in a collision over the channel. The remaining ten simply vanished. The two aircraft which collided near Waddington were in addition to these losses, as were a further three aircraft damaged beyond repair in landing accidents and one lost in a ditching. On the other side of the ledger, seven enemy fighters had been destroyed. The general impression of the raid, according to one 463 Squadron crew, was that the attack “generally fell short.” Another crew called it a “very poor prang.” Pilot Officer James – who had suffered the engine failure an hour before the target, jettisoned his thousand-pounders and carried on to attack on three engines – said it was “not a very healthy trip.” James also had to deal with the failure of the Monica early-warning system, half the guns in the rear turret and the entire mid-upper turret. In the circumstances this comment is a remarkable understatement. Phil Smith’s logbook shows that his target photograph was plotted some six miles south-west of the aiming point. He would not have been alone. 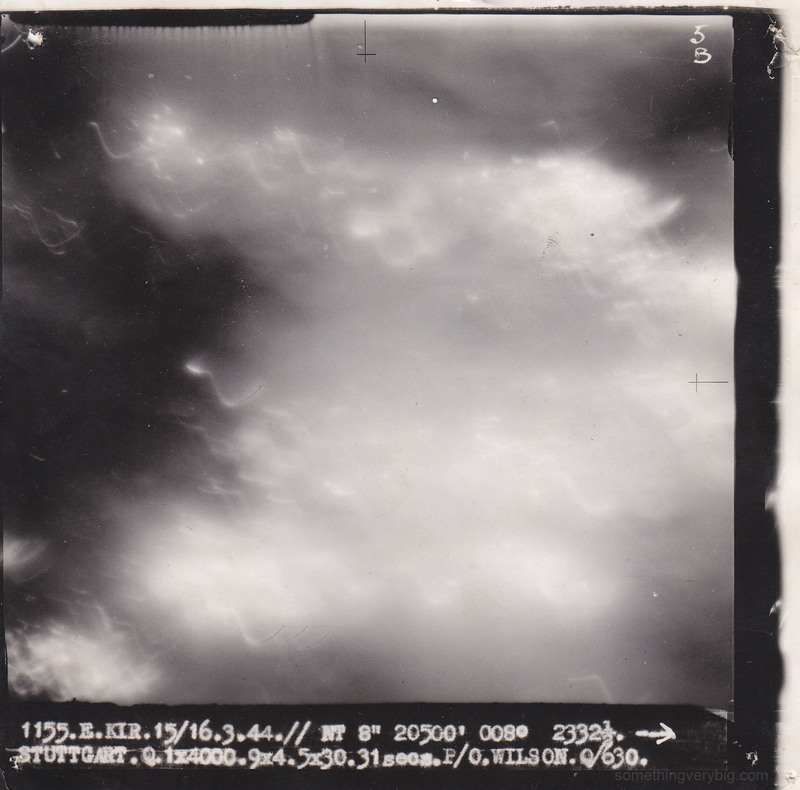 The crews’ initial impressions would prove correct when the photo reconnaissance results came in a week and a half later, showing that the raid was “scattered over a large area, mostly to the S.W. of the target.”  Staggeringly, no bombing photographs, according to the Night Raid Report, showed evidence that any aircraft (out of the 778 that reported attacking the target) got within three miles of the aiming-point. Once again, the critical importance of the Pathfinders had been made clear. If the Pathfinders were on target, the bombs would fall on the target. But if the markers missed, so did the following bombs. On this occasion, the Night Raid Report records, the weight of the attack “evidently fell outside the town”. Nevertheless, there did occur what it called “useful industrial damage,” albeit in suburbs and outlying districts rather than in the city itself. It also records a direct hit on a large railway viaduct and damage to a number of factories, but cautions that, as American bombers had attacked the city after this operation and before photographic reconnaissance was able to be carried out, some of the damage found must also be attributed to that later raid. While the Stuttgart raid was perhaps not the most successful in terms of damage inflicted, the Amiens force had better success. They caused heavy damage to the marshalling yards, for the loss of three heavy bombers. But the factory at Woippy escaped entirely when the attacking force found the target covered in cloud; all bombers brought their bombs home safely. The only other casualty from the evening’s operations was one Mosquito which failed to return from a Serrate patrol.